Remote dog training collars can be useful for training young dogs, stubborn dogs or trouble making dogs. It is always important that a training collar isn’t used as a way of disciplining your dog, buy rather as a way of getting your dog’s attention. It is important when looking for the best training collar, that you are looking for a training collar that doesn’t injure your dog. Look for a collar that has protection from accidentally shocking your dog for long periods of time, that has multiple levels of shock and that also has a vibration and tone function as well. Different dogs respond to different levels, and many will respond to just the tone or vibrate mode. That leads me to the Mothca Dog Training Collar Review. Modes: 4 training modes. Includes tone (beep), light, vibration and shock. Both vibration and shock have levels from 1 to 100. Size: Adjustable collar fits from 3.93 inches to 19.29 inches and works on dogs 10 to 120 pounds. Warranty: One year warranty. It gives you 12 months of replacement or refund. Accessories: 1 charging adapter, 1 (2 in 1) charging cable which allows you to charge collar and remote at the same time, 2 pairs of metal prongs, 2 pairs of rubber conductive anti-injury prongs, 1 static shock test light and 1 users manuel. This training collar is an updated 2018 version. It works for both the expert trainers and new pet owners. It is equipped with 4 training modes, which will help find just the right mode that your dog will respond to. The collar includes a tone or beep, light (I have to be honest, I have no idea what light mode is and I have researched it and can’t find how this works. If you know, please drop me a comment below. ), vibration and shock. Both the vibration and shock modes have customization levels ranging from 1 to 100. It is always best to start on the lowest setting and slowly work up, until you find the setting that your dog will respond to. This training collar comes equipped with a protection mode. The maximum amount of time you can deliver the vibration or static shock continuously is 10 seconds. After 10 seconds, the remote will go to protection mode. This helps prevent a mistake when you don’t realize your dog is getting corrected. It isn’t humane using over 10 seconds at a time on your dog. When the remote is in stand by mode, you can press a button that will take effect immediately. There is no need to first wake the unit up. There are separate buttons for sound, vibration and shock with separate adjustable up and down buttons. Through-wall remote control allows you to correct your dog if they are outside and you are inside. The range does decrease when going through the wall though. A big concern to many dog owners is if the shock collar will hurt their dog. Mothca has thought of that when developing their dog training collar. Besides having a wide range of settings to use, they also include semi-conductive anti-injury rubber prongs. These will reduce the skin to shock contact and they go directly over the conductive metal. Collar and remote will fully charge within 3 hours and should provide you with 14 to 20 days of use. Tone and vibration modes. Most dogs will get to a point where these are the only settings that you will need. Levels 1 to 100 for vibration and shock modes. Helps you find the right setting for your dog. This training collar is great for someone who is going to use it in dog parks, on walks, in the home or their yard. It has all the functions that you need from a training collar and it is easy to use. 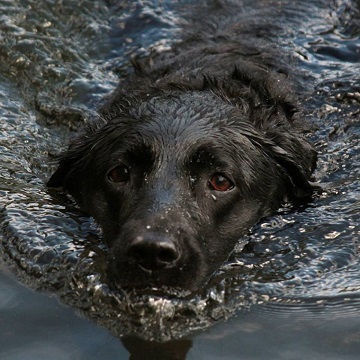 The Mothca Collar works even if your dog is a swimmer. If you are going to take your dog out in large areas where they are going to roam free, this is probably not the dog collar for you, since the range is a bit short for big areas. I wouldn’t recommend this collar for hunting dogs or dogs that have very large areas to run around in. I would suggest you take a look at the Sportdog Field Trainer 425X for a better option. This collar has a much greater range, but also costs quite a bit more. If you would like information additional information on other training collars, take a look at best dog training collars. This article will compare several training collars. Teaching a dog to come when called can be one of the biggest challenges in training a dog, but it can also save their lives. Using a remote dog training collar correctly should help prevent your dog from running in the road, chasing after other dogs or any of the other trouble dogs can get into. The Mothca Dog Training Collar Review should give you a better understanding if this is the right training collar for you and your dog. If you use a training collar properly, you can train your dog great recall and possibly save their lives. If the training collar is used poorly, it is not a good tool. You will need to spend time training your dog with their training collar. Your reaction needs to be immediate and consistent in order for your dog to understand and learn from it. You should always start with a tone or vibration before resorting to using the shock mode, and your goal is to get your dog to a point where just the tone will work to curb their behavior. A training collar, no matter what mode you are using, is a tool to get your dogs attention so you can direct them towards the behavior that you desire. Don’t use a training collar as punishment for your dog. Remember that if you dog is wearing a training collar, you should frequently move the collar around on their neck and remove the collar if it isn’t needed. Prolonged wearing of the collar can be irritating to your dog’s skin. Check your dog’s neck daily to make sure it isn’t irritating their skin.